Earthworms featured in the news announcement in May 2014 that a citizen science project had been launched to map the distribution of earthworms across Britain (BBC Today programme, 26 May 2014). The general understanding of the role earthworms play in improving soils and providing nutrients for plants to flourish can be traced back to the last book Darwin wrote, snappily-titled The formation of vegetable mould through the action of worms, with observations on their habits, which was published in 1881. Despite Darwin’s fears that a book on earthworms might prove a failure, it became a best seller. Earthworms had not always been popular. In the late eighteenth-century they were regarded as pests, and were viewed with suspicion. They were first championed as the friend of gardeners and farmers by the naturalist Gilbert White, who pointed out in his Natural History of Selborne of 1789 (a book Darwin claimed had ‘much influence on my mind’ (letter to W. T. Preyer, 17 February )) that without earthworms aerating the soil and producing casts (excrement) the earth would become cold, hard-bound, and sterile. 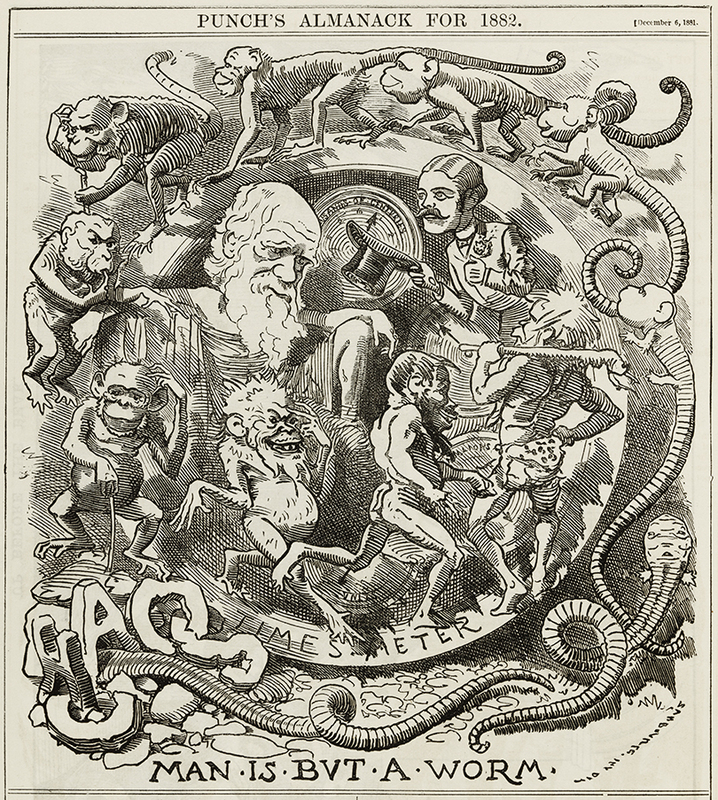 White believed that a monograph on worms would open up a new field in natural history, and almost a century later Darwin argued that all fields had passed through the intestines of earthworms. Although his monograph was not published until 1881, he had long been interested in earthworms, and they were the subject of one of his earliest scientific papers presented to the Geological Society of London in 1837. He had been inspired by observations made by his uncle, Josiah Wedgwood of the uniform structure of the superficial layer of earth. In the Victorian equivalent of crowd sourcing, CD called on family, friends, and scientific colleagues to help with his research over the next 44 years, as he went about calculating the volume of earth raised to the surface by earthworms (a stonking 161 tons per acre annually); exploring the disintegration of rocks by their digestive juices; discovering the depth to which they burrow; determining the altitudes to which they can be found; observing their feeding mechanisms and how they drag leaves into their burrows; and considering whether they might be intelligent. Finding the answers to these questions involved some unusual equipment and situations. His correspondence reveals the inventive methods he devised for studying the habits of earthworms, and the variety of strange things he persuaded people to do. Darwin concluded that worms had no sense of hearing when they failed to react not only to the shrill notes of a metal whistle and to being shouted at, but also to Francis Darwin playing the bassoon, and to Emma Darwin’s piano playing. From 1872, few members of the family were not involved. William, armed with a skewer and trowel, investigated traces of earthworm activity at Stonehenge, and Horace was later charged with making sure that 18 inch holes were dug at the foundations of the Roman antiquities at Chedworth and Cirencester to investigate whether worms possessed the power to lift a pavement. Leonard and George made calculations about larger castings on poorer soils, and Francis helped with calculations relating to the obliteration of ridges and furrows through the action of worms. Meanwhile Amy Ruck, Francis’s future wife, was in despair at not finding casts in Wales, not realising that this negative evidence was also valuable to Darwin. Thomas Henry Farrer, permanent secretary of the Board of Trade and husband of Darwin’s niece Katherine Euphemia Wedgwood, so entered into the spirit of things that he kept a worm journal. Darwin instructed another niece Lucy Wedgwood to probe worm holes to measure their angle relative to the surface of the ground. He suggested using knitting needles, but, perhaps thinking this too big a sacrifice, when Lucy reported her results she referred to having used a blunt wire. After a while, looking for earthworm casts became a habit; Francis noticed worm casts in fir woods near Zermatt, when on holiday in the Swiss Alps, and reported that his guide confirmed the existence of worms at that altitude. By the 1870s, Darwin was also drawing on the work of other naturalists, and as his research gathered momentum he began to ask colleagues and correspondents around the world to make observations for him. Soon worm excrement was trusted to postal services, and Darwin acquired casts from India and Australia. His interest in earthworms never waned, but it was not until 1880 that he began to draw together the observations he had gathered to write a book on the subject. Darwin brought to the topic the sustained attention that characterised all his work, and by the end of the year admitted that ‘My whole soul is absorbed with worms just at present!’ (letter to W. T. Thiselton Dyer, 23 November  (Royal Botanic Gardens, Kew)). In the end, however, as he told his son William, what he hoped his book would reveal is that ‘worms have much bigger souls than anyone wd suppose’ (letter to W. E. Darwin, 31 January  (CUL DAR 210.6: 173)). Comments on effects of prussic acid on different individuals of the same species and other physiological research by WP. Provides information about his studies in Edinburgh and Cambridge and qualifications he had forBeaglevoyage. Describes influence of R. E. Grant and J. S. Henslow. Asks her to probe worm-holes on grassy slopes with a knitting needle to ascertain whether they come out at right angles to the slope or to the horizon. Describes the occurrence of earthworms and the signs of earthworm activity in the neighbourhood. Gives results of probing worm-holes with wire. Data relating to experiments; shrinkage of earth on drying. WTT-D’s suggestion about absorbent function of pegs inAbroniasuggests origin of pegs inWelwitschia, which deeply interests CD. Previously could not see how pegs became large enough to be of mechanical use. Now thinks tissue between hypocotyl and radicle absorbs fluid, which would favour rise of peg to expose larger surface. Rejects German contempt for investigating use of organs. Asks WTT-D to observe how worms drawRobinialeaves into burrows. and an article by Romanes [see13029].